INSTALLATION of a nitrogen generator in the laboratory has improved workflow and reduced delays at a Nottingham-based chiral separations company, says gas generator manufacturer Asynt. 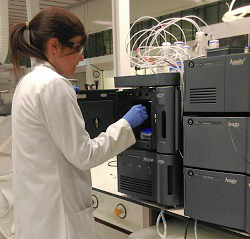 Reach Separations specialises in chiral chromatography for the analysis and purification of small molecules. The company uses high-performance liquid chromatography (HPLC) and supercritical fluid chromatography (SFC) to offer screening, method development, and purification of chiral and achiral molecules. Like many laboratories, Reach relied on bottled nitrogen gas to run its chromatography operations. Its recent investment in an in-lab nitrogen generator from Asynt has been worthwhile, the company says. Reach Separations’s senior purification scientist Victoria Coulthard said the Asynt gas generator was saving the equivalent of two nitrogen cylinders each day. The nitrogen generator has also eliminated the need to manoeuvre heavy gas cylinders from the store area to the laboratory. “We feel much happier knowing that a nitrogen generator provides our laboratory staff with a safer alternative to gas cylinders with minimal gas storage volume now required in the laboratory, and we envisage a return on our investment in around 18 months”, she added.